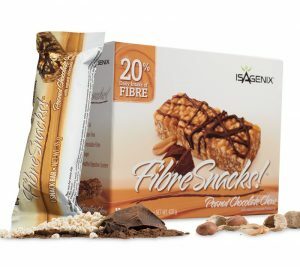 Isagenix Fibre Snacks - Cheapest Wholesale Prices in Australia! Boost your intake of fibre, in a delicious bar! The Isagenix FibreSnacks will give you 24% of your daily fibre needs in a delicious bar. They contain 6 grams of soluble and non soluble fibre that are key in good health. There are two types of hunger curbing fibre in each Isagenix FibreSnacks bar that support healthy blood sugar levels and slowing the absorption rate of carbohydrates. Prebiotic Fibre is great for your digestive system and good bacteria, helping support your immune system. Insoluble fibre helps curb your hunger by filling you up quick and supports regularity. Isagenix FibreSnacks are the ultimate fibre source! Each box of Isagenix FibreSnacks contain 12 bars, are gluten free and contain NO artificial colours and flavours.